Flavoured with cinnamon, clove and orange zest this moist cake also has a distinct crust which is sweet and slightly chewy. While it is a perfect afternoon tea treat I made this to meet a serious comfort eating need. I went to my high school reunion on the weekend and have had to confront the truth. I am old! And if the words 20 Year High School Reunion don’t equal Cake then what does? So this cake was made, and eaten, to mark my youth passing, celebrate (some) wisdom gained and gratitude that I am not still in high school. My school years were overwhelmingly boring. I lived in the Brisbane suburbs with 5 tv channels and no internet. What did we do with our time?! To me this cake was the obvious choice. The recipe was clipped out of the New Idea magazine in 1989 and was a family favourite throughout my high school years. Even now I still make it on occasion. I would highly recommend that you grind the spices yourself. It results in an entirely different, and in my opinion, far superior cake. The original recipe listed butter but vegetable oil can be used instead if that is your dietary preference. I have made it with both and I didn’t notice the difference, although I do tend to be heavy handed when measuring spices! It is a very easy cake to make which conveniently lasts many days in an airtight container and freezes well too. Do you have a favourite cake for comfort eating? Grease thoroughly a large gugelhupf/bundt tin and sprinkle some sugar all over. Sift together all of the dry ingredients and stir through the orange zest. Add the butter (or oil) and buttermilk and stir until well combined. Pour the batter into the cake tin and bake for about 50-60 minutes (test with a skewer). Allow the cake to cool in the cake tin for a while before demolding. 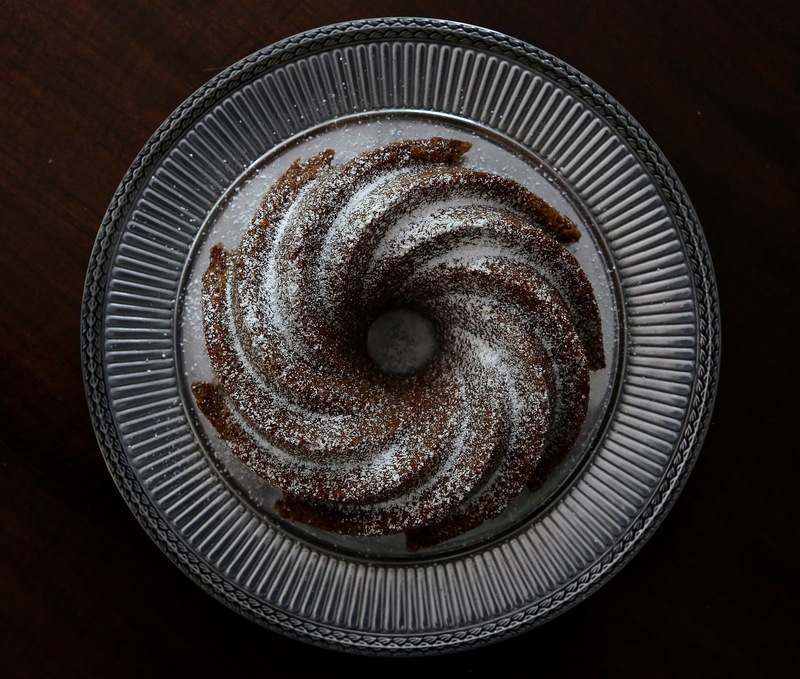 Place on a serving plate and dust with a little icing sugar. *You may make your own buttermilk by mixing white vinegar with milk (at a rate of 2 tsps vinegar per cup of milk). This works with either cow or soy milk. Posted in Cakes & MuffinsTagged buttermilk, cinnamon, cloves, egg free, food, food photography, high school reunion, New Idea, old age, vegan, vegetarianBookmark the permalink. Beautiful photo. I think I remember that cake too. I agree you are old but of course I am older and I think we are both wiser! Pretty!! Nothing like a bit of cake for comfort eating. Wish I had time to make it. Actually Chris’ brother made this lovely GF choc mud cake for Christmas dessert that was really yummy. Will fwd you the recipe when I find it. Thanks Kerryn! I look forward to seeing the gf mud cake recipe. Thank you! 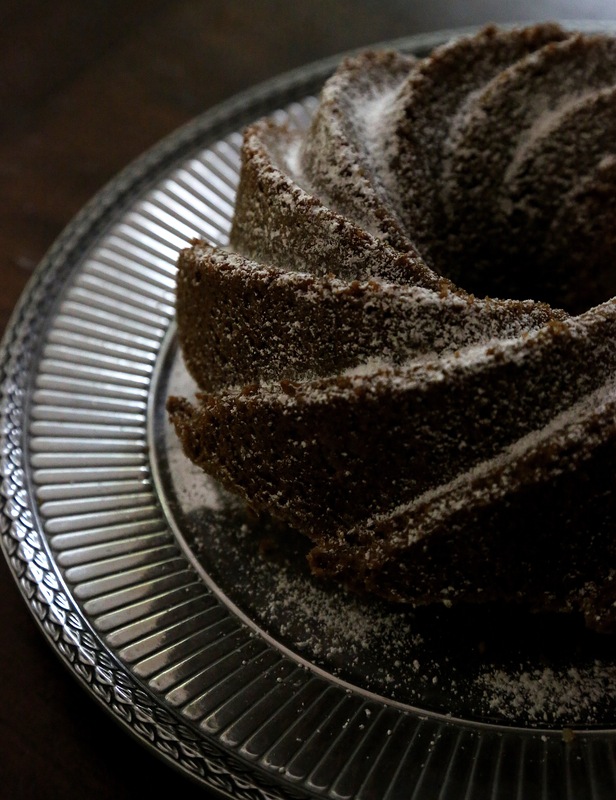 It’s a Nordic Ware bundt tin. They make very pretty bundt tins but they are so huge. I have two will have to stop at that! Thanks Christine! They’re such lovely tins that can make any cake look amazing. I love chocolate cake too and I have even made a chocolate version of this cake. I will do a post about it at some stage.